The video, best watched with the sound on, shows shards of ice crashing against the dock. You may have seen waves slapping across the shore several times. However, some parts of the world see such cold climate that it isn't only water that washes ashore - it's also broken pieces of ice sheets from that water body. A video that shows this phenomenon was shared on Facebook and has created a stir on the social networking site. US based-chef Brandon Bancroft recently went live on Facebook after noticing the rare phenomenon outside his restaurant The Blue Point in Duck, North Carolina. 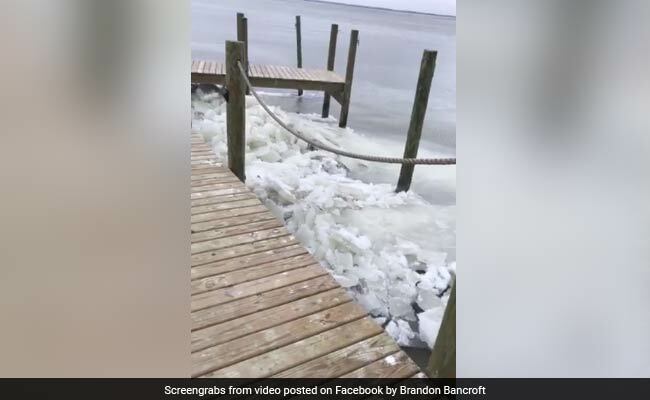 The video shows shards of ice crashing against the dock and makes for quite a startling watch. The restaurant overlooks the Currituck Sound, an inlet of the Atlantic Ocean. According to The News & Observer, Mr Bancroft and his colleagues noticed huge sheets of ice moving towards the shore. The video, best watched with the sound on, shows shards of ice crashing against the dock. In a strange moment in the video, a pole standing in the way of the frozen waves causes the sheet to break apart. You can also see the broken shards of the ice sheet collect around the base of the dock. "We looked outside and saw the one pole cutting through the ice," Mr Bancroft told The News & Observer. "We wondered how it was happening, so we ran out to check it out." "The whole sound was frozen over, and the very center cracked, and it split like a river in the middle," he added. He went live on Facebook to document the sight before him. Since being shared on January 4, his video has collected over five lakh views and almost 7,000 shares. "Awesome video. That's a rare exciting natural phenomenon to catch on video," says one Facebook user about the video. "I wouldn't be standing on that pier!" says another.